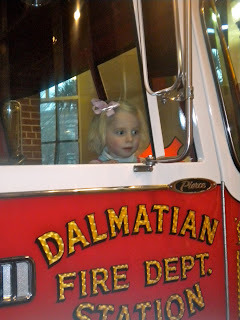 Here are more birthday pictures from the kids' museum. Tucker loved sliding down the slide in the snow room! Firefighter Caroline was hard at work. 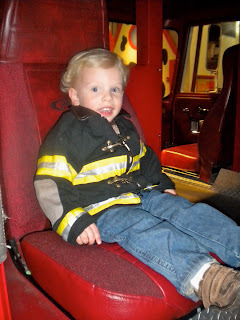 Caroline enjoyed hanging out in the fire truck as we took lots of pictures. Not so fast, Tucker ... you've got about 14 more years! Tucker and Mommy sitting on the front of the truck. Surprisingly, Tucker did not want to be on the truck by himself. Tucker is such a helpful little boy pumping the gas. Caroline LOVED this grocery store! Tucker and some other little girl checked out Caroline's goods. "That Car Horned at Me!"